Karloff stars as Dr. Adrian, a man who becomes obsessed with curing paralysis when he loses his beloved wife and daughter to the disease. Desparately trying to cure a crippled neighbor, he discovers that he needs human spinal fluid for his vaccine -- but how to get it? When an ape trainer at a local circus is badly mauled, the doctor allows him to die so that he can tap his spine. The gorilla escapes and goes on a killing spree terrorizing the small town. 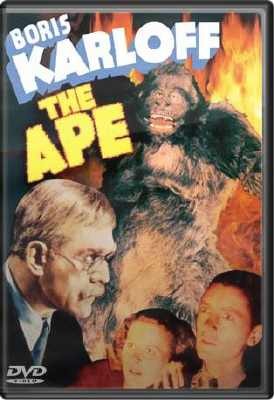 A cult classic, The Ape was Karloff's final film for Monogram.